Breezewood Pools Inc., located in Bolton Ontario, was founded in 1976 by Carl Baker. Originally a services-only company, Breezewood Pools began building a reputation for providing excellent customer service with its growing list of pool opening and closing customers. When Carl was ready to retire in 1992, the business was purchased by Chris and Fred Baldwin. Chris and Fred worked tirelessly to build Breezewood into the proud organization it is today. The company's retail presence helped expand its service customer base, and helped cement Breezewood’s reputation in the community as a knowledgeable and reputable company. Chris ran the retail store and was well-known in the community for her friendly demeanor and impeccable knowledge of everything pool and water chemistry-related. Fred ran the service side of Breezewood and was adored by the customers for his warm disposition, strong work ethic, and high quality workmanship. Together, Chris and Fred built Breezewood Pools into the leading pool services company and retail store in the Bolton/Caledon-area. In early 2015, Chris and Fred were ready to retire and spend more time with family and friends. Matt and Effie Gibbons purchased the business from Chris and Fred, becoming the 3rd generation of Breezewood Pools owners, continuing the firm’s husband-wife family management tradition. Matt Gibbons grew up an avid swimmer and was surrounded by swimming pools in his Mississauga neighbourhood. He learned all about pool maintenance at a young age, helping maintain his grandparents’ pool and enjoying the fruits of his labour. He was raised in a very entrepreneurial family, with his grandfather having been the founding President of Braun Canada. Upon completion of his B.A. from the University of Western Ontario, Matt began a career in retail and commercial banking, specializing in investment strategy. In 1999, he had the opportunity to change course and become General Manager of United Road Signs Corp. (URS), a family-owned business that provides highway traffic management and signage services to the Ontario road building industry. Matt enjoyed tremendous success in this role and built URS into one of the Ontario’s leading traffic management companies, working on many of Southern Ontario’s biggest and high-profile highway building contracts. After leading a successful sale of the business and transition period, Matt was looking for a new challenge and came across Breezewood Pools. He is now President of Breezewood Pools, and works hands-on, managing the service side of the business. Effie grew up in an entrepreneurial family as well, with her parents running a successful restaurant for many decades. She learned the values of hard work, integrity, and great customer service at a young age as she helped in the family business, and learned retail operations in her job at The Bay. After graduating from Humber College, Effie became a resource teacher, helping children with special needs. After having children of her own, Effie has spent her time volunteering extensively in the community in her role as Chair of Home & School Council for Montclair Public School in Oakville. Working alongside the store manager and staff, Effie now helps manage the retail store part of Breezewood Pools. 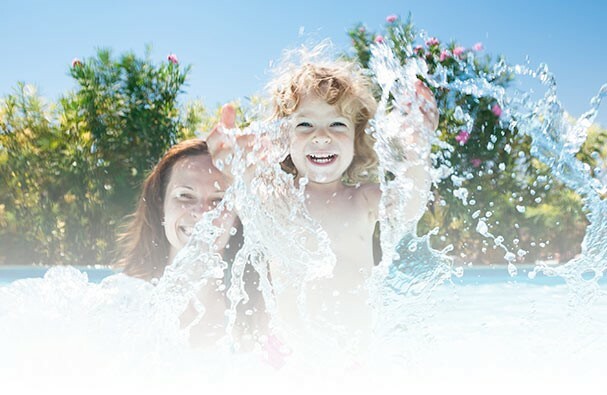 Breezewood Pools is well-positioned to continue to successfully serve the Bolton, Caledon, and surrounding areas for many years to come. Matt brings over 15 years of successful business experience as well as an MBA degree to Breezewood. He and Effie share the same strong values as Chris and Fred Baldwin, ensuring that Breezewood Pools will continue to operate as a customer-focused organization, operating with integrity, reliability, and a commitment to the highest quality products and workmanship. Breezewood Pools has a fully-stocked retail store offering free computerized water analysis using the state-of-the art LaMotte Spin Lab, as well as a traditional wet lab. The store carries a full line of pool and spa chemicals, accessories, and all types of pool equipment. Explore our Products and Services pages for more information.